Clearly, galaxies are discussed a lot around here as we spend our time studying them. There’s a lot of terminology that can be confusing at first. Of course, it becomes second nature after a while working with galaxies, so it’s hard to avoid using. This post is a basic introduction to galaxies and some of the common terminology – it’ll be a good reference for future posts that talk about specifics of galaxies. The Hubble tuning fork (pictured below) is the main method used for classifying galaxies. This sequence divides galaxies into two main types – spiral and elliptical – and then subdivides those further based on their appearance. Elliptical galaxies have smooth light profiles and, not surprisingly, are elliptical in shape. They are further classified by a number (0 to 7) that describes how elliptical they are: E0 galaxies appear circular and E7 are the most elongated. The differences in the shapes of various elliptical galaxies is mostly a result of viewing the galaxies in different alignments. Sometimes we see the end of an elliptical galaxy and it appears more circular; other times, we see the long side of the galaxy facing us. Spiral galaxies have a central bulge and spiral arms. The split in the tuning fork is the split between spirals and barred spiral galaxies, which have a bar connecting the bulge to the spiral arms. The classifications from Sa to Sc describe how prominent the bulge/spiral arms are. Sa galaxies have a dominant bulge and small, tightly wound spiral arms. Sc galaxies have a small, faint bulge and loose spiral arms. The S0 galaxy is a transition from elliptical to spiral. This galaxy type has a faint disk and massive bulge, but no spiral structure. The terminology early and late type to describe galaxies is frequently used. Elliptical galaxies are early-type: they formed their stars early in the universe and have a remaining old (and red) stellar population. They’re often referred to as “red and dead”. Spiral galaxies are late-type: they have current star formation and have young stellar populations that include bright, blue stars. One way to remember the early- vs. late-type distinction is to think of the Hubble tuning fork as an evolutionary sequence. Originally, Hubble thought his classification of galaxies presented a life sequence of galaxies, from elliptical evolving to a tight spiral to a loose spiral. Now, we know this isn’t true (in fact, we believe spirals turn into ellipticals when processes stop star formation), but it is one of the origins of the ellipticals as “early” galaxies and the spirals as “late” galaxies. To make things more confusing, the classifications of early- and late-type can also be applied within the spiral galaxy category. S0 and Sa galaxies can be referred to as early-type spirals. This is because they have a strong bulge component, which contains old, red stars like elliptical galaxies. Sc galaxies are dominated by the spiral disk, which is full of young, blue stars, so they are late-type spirals. In terms of ALFALFA, one of the important distinctions between a late- and early-type galaxy is gas content. Late-type galaxies have lots of neutral hydrogen gas that serves a reservoir for the ongoing star formation. Early-type galaxies have little to no gas, so they have no material out of which to form stars. There are two other main classes of galaxies not shown on the tuning fork above: irregulars and dwarfs. Irregular galaxies are exactly what they sound like – irregular in shape. Typically, these galaxies are the results of interactions and mergers that we happen to be seeing while they are still disturbed. Dwarf galaxies are galaxies that are much less massive and bright than the spirals and ellipticals and are often found as satellites around the larger galaxies. The dwarf galaxies follow a similar scheme to the larger galaxies. There are dwarf elliptical (dE) galaxies which have old, red stellar populations. Dwarf irregular (dI) galaxies are late-type dwarf galaxies: they are gas rich and have ongoing star formation. I’ve been done with the first part of the processing for a while, and now it’s time for the final step to become Level 1 data – flagging. Basically, this is the step where I’m “cleaned up” for future work. This step is somewhat time consuming, which is why I’ve had to wait to get here – the people doing the flagging have lots of other work to help keep them busy and haven’t been able to do the flagging as fast as I’m being observed at the telescope. This is a ‘good’ picture of the flagging process – I’m being very well behaved in this data set. (There are plenty of examples where I’m not so nice that I’m sure will be shared in the future.) The horizontal axis is channel number, or frequency. The left end is the lowest frequency observed and the right end the highest. The vertical axis is time, from 0 to 599 seconds, encompassing the length of one drift. (For the ALFALFA drift-scan survey mode, time corresponds to a position in right ascension and the known beam position for the night gives a declination.) The two boxes on the edges (numbers 0 and 1) are the result of the bandpass edges having a lower response (see the first picture in this post), which generates poor data quality, and not of human-generated RFI. In this picture, there’s actually very little RFI present. You can see a skinny box to the left labelled with the number 5. This box is where the FAA radar for the San Juan airport shows up. It is barely present here, which means that the airport has decided to use their radar at a lower frequency, outside of the range observed for ALFALFA. The other prominent feature is the bright signal to the right. This isn’t flagged with a box because it’s not RFI – it’s our Galaxy! This is a real signal, so I don’t want people to remove it from me. While this is a good picture of me, it’s also a little boring; you can see bright galaxies at this step, but there aren’t any in this picture. Now that I’ve been flagged, I’m Level 1 data. Next up, I start processing to become Level 2 data. These steps will be about creating ‘grids’ – this is the format I’m put into for source extraction, the end goal. How Hot is That Galaxy? You may have noticed that in the last two posts talking about data calibration that the data is measured in temperature units. This is one of the (many) weird things about (radio) astronomy – the use of temperature to measure the response of the telescope to a source. I call this use of temperature for measurement weird because most radio sources are non-thermal (their measured radiation is not the result of random thermal motions of particles). Like most unusual things in astronomy, this is mostly a result of historical use, but there is reasoning behind the use of temperature units. You may have encountered the Planck black body curve before. If not, a picture of the curve is below. 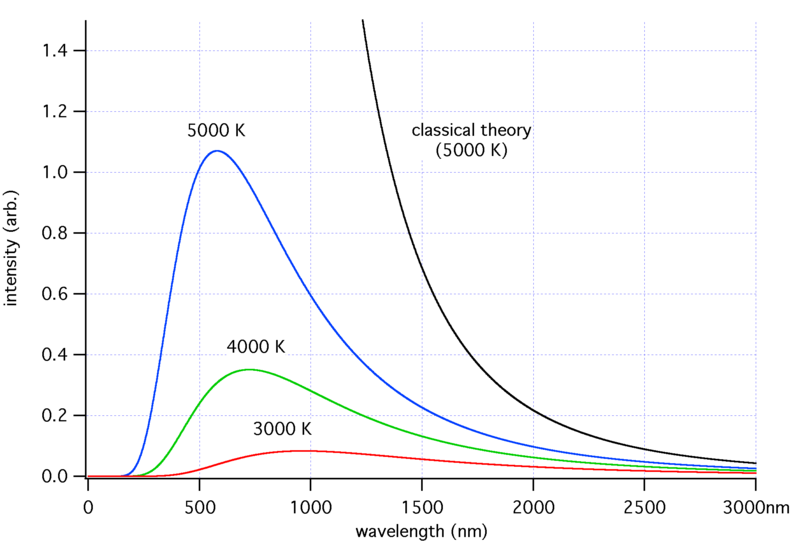 The Planck curve simply describes the intensity of a radiating source of a given temperature at different wavelengths (or frequencies). At the long wavelengths of the radio regime, this curve can be approximated as a simple relation between the intensity, wavelength and temperature of a source ( ), which is known as the Rayleigh-Jeans law. Thus, it is simple to relate the measured intensity of a source to a temperature at radio wavelengths. Now, I mentioned that most radio sources are non-thermal. However, for a given intensity and frequency/wavelength, it is still possible to use the Rayleigh-Jeans law to calculate a temperature as though the source were a thermal radiator. Radio astronomers refer to this as a “brightness temperature”. It doesn’t relate to the actual temperature of a source (as measured by random thermal motions of particles), but it is a convenient way to describe the intensity of a source. Historically, this use of brightness temperature developed because of an assumption that all sources would be thermal sources. One of the reasons the temperature measurement is useful is because it is a good way to characterize noise. If you are worried about spill-over radiation from the ground into your radio dish, you are concerned with black body radiation at 300 K (room temperature). The noise of a receivers is also characterized in temperature. Original receivers were dominated by thermal noise as they were often at or near room temperature. Now, receivers are cooled to decrease the noise but they are still characterized in a temperature. (For example, ALFA has a system noise temperature of 30 K.) Thus, if you want to know how strong a signal you need to be measurable above the noise of the receiver, it is useful to know the signal in the same units as the noise – temperature. Last time I talked about my initial processing. Part of this was the ‘bpd’ process in which I was bandpass corrected. I have a few pictures that I thought I would share. The first picture is from before I was bandpass corrected. You can see that the response (vertical axis, measured in temperature) varies with frequency (the channel number). Ideally, I should have the same response everywhere so that it’s easy to tell how strong a signal is, no matter what channel it falls in. You can see that the bandpass edges are particularly bad and my response falls off quickly. In order to have the best data quality possible, the bandpass response needs to be divided out; areas of high response are weighted down and areas of low response are weighted up. Now, I don’t want to lose any of my information which means we have to be a little careful. That strong response you see in the middle is real – it’s hydrogen in our own Galaxy! I don’t want to lose that, so we interpolate around the Galactic hydrogen, fitting a smooth function over the extent of the signal. This is a picture of me after I’ve been bpd-ed. You can see that my response is now flat across all channels and that the Galactic hydrogen is still visible. This means I’m all ready to go for the next step. Sorry for the lack of posts this last week. I was out of town all of last week working on a non-ALFALFA science project. (Still galaxies, just not galaxies found with ALFALFA). I did get to give a talk on ALFALFA, though, which was fun. Although I only felt like that after the talk. If you had asked me before giving the talk, I might have shared different sentiments. I’ll be catching up with ALFALFA projects and the exciting life of a graduate student this week in Ithaca, so things may be slow for a bit longer. Until then, you should check out Diamonds in the Sky, a collection of astronomy science fiction. And you should definitely check out Galaxy Zoo 2. I love the Galaxy Zoo project (and am slightly jealous). The goal of the Galaxy Zoo project is to have the public help with galaxy classifications. The human brain can distinguish different galaxy types relatively easily (with a little training) while computers are not yet capable of doing this sort of classification. Galaxy Zoo provides a large dataset and asks users to answer questions about galaxies. I suggest you go check it out – it’s lots of fun.